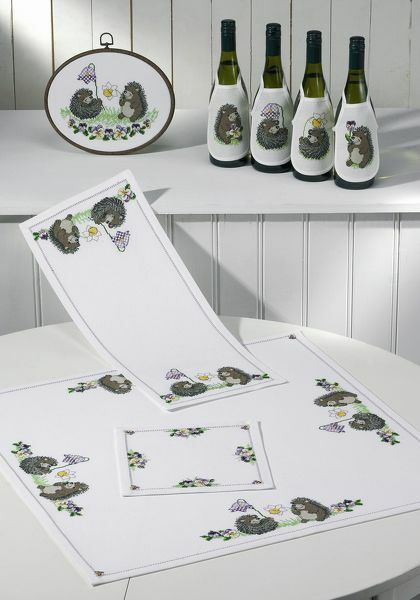 Pretty table mats with cute cartoon hedgehogs and flowers. The small table centre has only pansies worked in whole and half cross stitch and backstitch using nine shades of stranded cottons over 120 by 120 stitches. The pattern is printed 10 stitches to 3 centimetres on an A3 sheet with key. The larger table centre has the design printed 10 stitches to one inch on two A3 sheets and is repeated four times in all. The pattern is worked in whole cross stitch, half cross stitch and backstitch using 14 shades of stranded cottons. The table runner with two repeats of the hedgehog design is stitched over 120 by by 320 stitches using 14 shades of stranded cottons.